European eel Lat. :Anguilla anguilla is a panmictic species distributed from the North Cape in Norway, southwards along the coast of Scandinavia and the Baltic states throughout Atlantic Europe and all the coasts of the Mediterranean including North and West African Coast (Schmidt 1909, Dekker 2003). It very rarely enters the White and Barents seas, but it has been recorded eastward to the Pechora River in northwest Russia. The species occurs in low abundance in the Black Sea where it migrates east to the Kuban canals (occasional individuals reach the Volga ),. A report by the ICES Study Group on Anguillid Eels in Saline Waters (SGAESAW) indicates that eel populations typically contain a mix of freshwater residents, saline water residents, and inter‐habitat migrants (ICES/SGAESAW 2009). It also widely occurs in most inland waters of Europe (e.g. lakes). It is thought that the continental distribution of the European Eel is over an area of approximately 90,000 km² in Europe and parts of North Africa (Moriarty and Dekker 1997), with a substantially larger range if their marine distribution is considered. Humans have enjoyed a close relationship with the eel for many thousands of years. Eels have been an important source of food and many local cultures and traditions have developed throughout Europe and North Africa. The eel is noted for its strength and endurance. As long as man can remember, this fantastic creature exists and has survived dramatic changes in the earth’s climate and is capable of swimming thousands of kilometres to reach its spawning grounds. Eels are presumably born somewhere in the ocean in the Sargasso Sea. There is evidence to suggest they spawn in the Sargasso Sea, but so far man has never witnessed the actual spawning event in the wild. Once born, eel larvae float en masse across the Atlantic. Arriving at the European Coast glass eels they try to enter inland fresh water basins to continue their development. After two years, when fully grown and sexually mature, eels return to their spawning grounds in the ocean. The European coastline is nowadays so well-protected with flood defences that young eels have great difficulty reaching freshwater and silver eels face even greater difficulties swimming out to sea to make the return journey. The blocked migratory pathways are the main cause of the dramatic decline in the numbers of eels over the recent centuries. Other causes such as pollution, natural predators and overfishing made the situation even worse. From a situation of super abundance where the eel was once the basis of tax payment to today, where it is highly protected through the European Eel Regulation. 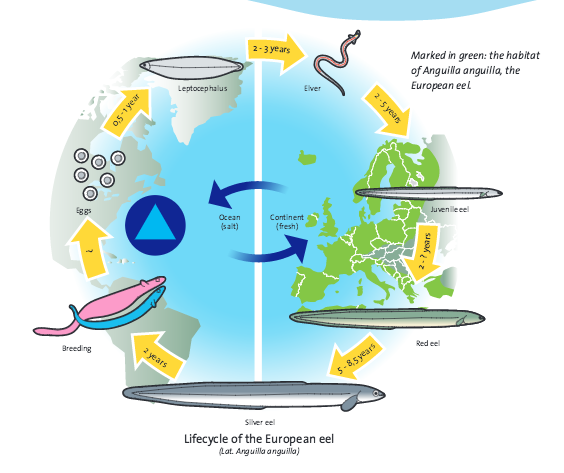 The Eel Stewardship Fund is established to help finance a large number of activities that contribute to the recovery of the eel stocks in European inland waterways and coastal lagoons. These activities include the restoration of the eel’s lifecycle.